In a Nutshell: Online crowdfunding platforms garnered substantial media attention after several natural disasters impacted areas around the world in 2017. Multiple relief campaigns raised millions of dollars and showed the resilient spirit of the global community. While most platforms see donations spike when disasters strike, GlobalGiving.org works continuously with nonprofits around the world that request funds for communities with ongoing needs. These causes can include improving education to underserved areas, providing clean water and healthy food to impoverished villages, or rendering medical services to those in need. GlobalGiving’s electronic gift cards allow recipients to distribute funds to causes of their choice. I conduct substantial research before writing about any company or nonprofit. Over the years, I’ve spent countless days researching the intricacies of cryptocurrency and financial markets. I’ve compared enough credit cards to fill a swimming pool and know the fine details of the economies of countries I’ve never set foot in. But writing this piece is different because before I even started my research, I had an emotional investment in the company thanks to a single email. Crowdfunding platforms aren’t new — there are literally dozens of them on the internet. But crowdfunding gift cards are something I’d never seen. As I prepared to research GlobalGiving.org, I started by donating the proceeds of an electronic gift card I was sent to use on the platform. The hardest part of using the card was choosing from among the dozens of worthy causes the site listed. I opted to donate to Help Children in Haiti Stay Clean, Dry, and Healthy since I’ve always been partial to fundraisers involving children. The process of using the card took less than a minute once I selected a cause. The effect giving had on my mood and mental state lasted much longer. We’ve covered several crowdfunding platforms over the years and found each to have a sincere interest in spreading goodwill around the globe. Just as some platforms vet the causes they host campaigns for, we make certain that any organization we cover is equally unique and worthy of your attention. GlobalGiving checks off each of our boxes in that it only works with nonprofits that are bringing about true change in communities around the globe. In 2002, co-founders Mari Kuraishi and Dennis Whittle used their experiences working at the World Bank to create a platform that is truly charitable at its roots. 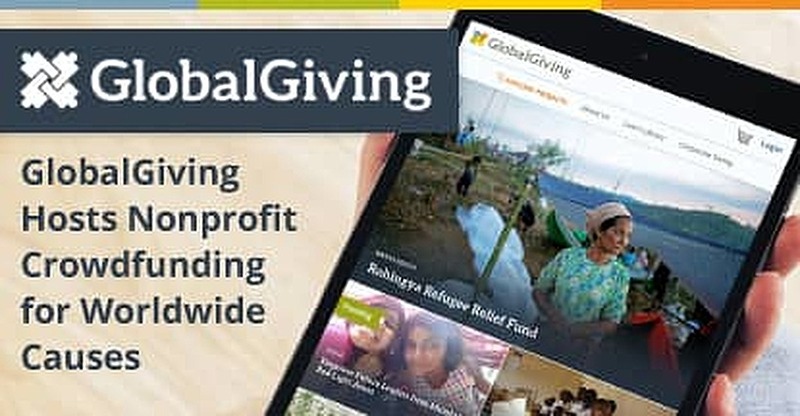 “They were used to giving billions in top-down aid, and really wanted to create a more democratized philanthropy where communities from around the world could come and request funding for what they thought was important,” said Ingrid Embree, Senior Director of Strategic Partnerships at GlobalGiving. To date, more than 800,000 donors from 192 countries and territories have funded 18,000 projects in over 170 countries. All donations are tax-deductible and take just minutes to complete. Causes featured on the platform impact entire communities and provide support for programs that touch lives throughout a region. These causes can include improving education to underserved areas, providing clean water and healthy food to impoverished villages, or helping people recover from natural disasters. Before a nonprofit can begin requesting donations on the GlobalGiving platform, it must pass a detailed vetting process and has the option to complete an online educational course on responsible crowdfunding practices. Once GlobalGiving is comfortable with the structure of the nonprofit and the nonprofit’s track record of social impact, the real work begins. GlobalGiving also makes it easy for nonprofits to plan their crowdfunding campaigns in advance by posting the platform’s schedule of promotions for the entire year each January. Possibly the most unique aspect of GlobalGiving’s business model are the gift cards available for purchase online in any denomination above $10. Card recipients choose the cause — or causes — they donate to, spreading the funds across multiple campaigns if they wish. Embree said many companies give GlobalGiving gift cards to employees as anniversary gifts or to commemorate holidays such as Thanksgiving. Every month, Dell EMC sends $25 gift cards to any employee celebrating an anniversary with the company that month. Embree said other businesses give gift cards on an employee’s first day of work. Embree said many of GlobalGiving’s most successful crowdfunding campaigns have focused on disaster relief. The platform partners with social media websites, such as Facebook, to collect funds from donation buttons added to well-being check-ins after major disasters. GlobalGiving’s goal is to partner with nonprofits based in the communities seeking aid. By doing that, donations first serve the people who need it most. Donating to a worthy cause is fast, easy, and tax-deductible through the GlobalGiving platform. Every nonprofit listed on the website has passed an intense vetting process and has completed courses on responsible and successful crowdfunding. Most importantly, each cause serves the global communities that need the most help. Each nonprofit understands the needs of the local area and uses area resources to support their local economies while effecting change.